Discover how you can become part of an exciting movement in the industry. At last, the importance of physical activity and regular exercise is on the healthcare radar. With obesity, diabetes, heart disease, hypertension and myriad other chronic health conditions epidemic throughout the United States and the rapidly growing number of Medicare-eligible adults expected to reach 71.5 million by 2030 (Administration on Aging 2004), demand for disease prevention and cost-effective, quality health-promotion interventions is at an all-time high. Add a body of research showing the potent benefits of exercise, and physicians and hospitals start taking notice. What that means is a new wide-open career path for qualified fitness professionals. Here’s what’s happening in medical fitness and what it takes to be a part of it. Medical fitness—individual or group exercise training for people with or at risk for chronic or other health conditions or for those individuals requiring specialized care (such as older adults and people with disabilities)—is booming. In fact, John McCarthy, retiring executive director of the International Health, Racquet & Sportsclub Association in Boston, recently named medical fitness #4 in the top 10 reasons why the fitness industry will continue growing. Today, more than 700 medical fitness facilities serve nearly 2 million members, and there’s been almost a 1,000% increase in the number of hospital-owned or physician-sponsored wellness or fitness centers in the past two decades (Medical Fitness Association 2004). While the traditional fitness center catering to healthy young adults still thrives, a different kind of club—and a different kind of fitness professional—is emerging to meet the fitness needs of a variety of special populations. According to a recent MFA press release, “Many factors distinguish the medical fitness model from commercially based health and fitness operations, including but not limited to: active and regular medical oversight; qualified and credentialed staff; disease management and clinical integration of programs; utilization of an individual’s personal health status in creating an individualized exercise prescription to reduce their overall health risk; safety; and a focus on improving community health” (Medical Fitness Association 2006b). Importantly, while medical fitness focuses on the care of special populations, it also aims to promote primary and secondary prevention. That is, most medical fitness facilities and professionals are well equipped to work with a wide diversity of individuals, from perfectly healthy college students (primary prevention) to clients with a new hypertension diagnosis (secondary prevention) to those who have recently been released from cardiac rehabilitation following a triple bypass surgery (tertiary prevention). The medical fitness professional “provides a safe and effective bridge for the patient to cross from the structured clinical treatment and/or rehabilitation environment to mainstream community or home-based exercise,” writes David E. Upton, PhD, in the American Council on Exercise’s (ACE) Clinical Exercise Specialist Manual (American Council on Exercise 1999). In other words, medical fitness professionals help a client make the transition from medical management and/or physical therapy to a regular physical activity program following a surgery, an injury, a medical diagnosis or exacerbation of a pre-existing condition. (See “The Continuum of Care” below. The range of clients seen by medical fitness professionals is as vast as the range of patients treated by an internist or a family doctor. Clients can include people with diabetes, obesity, hypertension, neuromuscular disorders, heart disease, lung disease, osteoporosis, orthopedic injury, cancer, HIV/AIDS, dementia . . . and the list goes on. Because it’s difficult to master exercise programming for every special population, most medical fitness professionals specialize. “I find it a dilution of our services if we try to be everything to everyone,” says Anthony Carey, MA, owner of Function First Inc. in San Diego. “Give these clients who are higher on the risk continuum the best you have by knowing your area inside and out,” he recommends. Perform pre-exercise health risk assessment. Identify exercise benefits and goals. This approach not only assures high-quality care for each client but also provides important health information for the individual. And when this information is appropriately documented and communicated with the client’s physician, the medical fitness professional more effectively gains that physician’s trust and respect. The approach also helps the client transition back into his or her community with support and encouragement to permanently adopt a safe, effective physical activity program. Like any new field, the medical fitness industry faces some important challenges. For one, medical professionals are hesitant to openly embrace a new member of the team, especially when the educational background, quality assurances and payment structure are so murky. The fitness industry does not have a well-established standard of care. Medicine and most other healthcare professions, by contrast, follow specific evidence-based protocols when providing care to patients. The health professions are also highly regulated entities requiring specific educational qualifications, clinical experience and licensure. The fitness industry is unregulated and requires minimal qualifications for entry. In order for medical fitness to be accepted as legitimate, the profession must establish a universally accepted standard as the foundation for training, facility requirements, program design, assessments and outcome documentation, says Mary Sanders, PhD, associate professor in the School of Medicine at the University of Nevada, Reno, and a long-time fitness professional. In an effort to move the industry forward, the MFA has developed guidelines and recommendations for medical fitness facilities. Included in these guidelines are minimal recommended qualifications for medical fitness practitioners. For example, the MFA recommends that personal training staff and group exercise instructors employed at medical fitness facilities have at least an associate or a bachelor’s degree in exercise science or a related field; at least one current certification accredited by the National Commission for Certifying Agencies; and current certification in cardiopulmonary resuscitation and the use of automated external defibrillators (CPR/AED). The guidelines also delineate credential recommendations for fitness directors, fitness staff working with special populations (such as cardio/pulmonary and orthopedic rehab and postrehab, and weight loss) and aquatic directors and staff (Medical Fitness Association 2006a); and propose specifications for medical fitness facilities. In general, insurance companies do not reimburse for medical fitness visits. While medical fitness professionals debate whether or not reimbursement is worth pursuing (insurance reimbursement for medical fitness professionals is discussed extensively in the July–August 2005 issue of IDEA Fitness Journal), clients currently pay for most medical fitness services out of their own pockets. 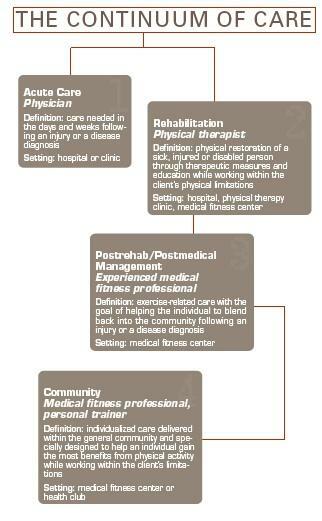 This is similar to how nonmedical personal trainers are paid for their services. However, the difference is that many people expect their insurance companies to pick up the cost of health-related expenses. When clients make the transition from the services of a physical therapist or a physician—both paid for by insurance—they may be unable or unwilling to pay the premium for an exercise professional to train them. Medical fitness professionals are faced with the challenge of differentiating themselves from the late-night infomercials and quick-fix workouts that many people—including physicians, physical therapists and other health professionals—associate with fitness experts. In order to gain acceptance as members of the healthcare team, medical fitness professionals need to demonstrate competence and responsibility in every professional interaction. Without industry regulation or licensure, it’s an uphill battle—especially when some unqualified individuals try to profit from the medical fitness boom. If you find the challenges and rewards of medical fitness exciting and think you might like to pursue a career in this growing field, consider this advice from the experts to ensure that your journey is rewarding and successful. The future prospects are bright for those willing to go through the training and become educated, says Sanders. But that road is long—especially for those without a degree in exercise science or a related field. Carefully assess why you want to pursue a career in medical fitness before jumping in head first. “If you are working with people with advanced challenges, then you should have the advanced preparation yourself,” says Carey. Educational opportunities are available through a variety of academic settings, schools of public health, nursing schools, community colleges, evidence-based training programs linked to medical programs, and organizations such as the American College of Sports Medicine (ACSM) and ACE, notes Sanders. The gold standard is a bachelor’s or master’s degree in exercise science or a related field and a reputable certification, such as ACSM Exercise Specialist, ACSM Registered Clinical Exercise Physiologist, American Academy of Health, Fitness and Rehabilitation Professionals (AAHFRP) Medical Exercise Specialist or ACE Clinical Exercise Specialist. Beyond degrees and certifications, however, don’t forget the importance of practical experience and clinical skills. “Medical fitness is more than a certification; it is being able to recognize deficits [and understanding that] the whole body is connected,” says Linda Wargo, a physical therapy assistant and part-time medical fitness trainer for clients with orthopedic concerns, based in DeFuniak Springs, Florida. “A person can sound knowledgeable, have a good client base and in the long run shortchange the client.” Webster encourages anyone interested in trying out a career in medical fitness to complete an organized internship. If this is unavailable, develop a relationship with local physicians, physical therapists and other providers to learn what they do. Also shadow a practicing medical fitness professional, says Sanders. “Consider taking personal initiative to become educated on medical conditions and physical activity (the science) and to develop the skills (the art) through guided practice,” she advises. It’s essential to get comfortable with the medical model. A major challenge for the medical fitness professional is to learn and adhere to widely accepted practices and protocols that other health professionals live by, such as documenting visits and outcomes and developing individually tailored programs based on proven methods, says Sanders. The goal is to evaluate, understand and educate clients, document sessions and communicate outcomes with other providers all within the allotted time. Learn these skills by shadowing a variety of health professionals, or take a class on medical terminology and documentation at a local community college. Establish ties with both health professionals and clients. “The medical networking involved with this field is extremely critical to establish and promote the relationships necessary to gain the respect, receive the referrals and ultimately have reciprocation with the medical community,” says Williamson. She recommends that to begin developing a network, you seek out opportunities to communicate and interact with health professionals in a way that will promote growth and professional development. Some ideas are attending local conferences and talks that address medical fitness issues, taking a class on a health condition that interests you, becoming actively involved and visible in promoting activity and health in your community, strengthening relationships with providers you already know and learning more about local providers so that you can refer your clients. “The key is building a two-way relationship with the medical community [you] plan to work with,” says Dennis Dewane, a physical therapy assistant and director of personal training in Syracuse, New York. “Refer clients to them first. This will open doors to building a referral base.” And as every personal trainer knows, satisfied clients are also a great source of referrals for future clients. In order to succeed as a medical fitness professional, you must have a keen business sense and communication skills to generate positive word of mouth, a referral base and a steady flow of income. “The ability to work with people and to understand their concerns is key in the field of health and fitness,” says Cary Wing, EdD, executive director of the MFA in Richmond, Virginia. What else? “Not only do you need to have the best product; you need the best service providers and superior customer service,” says Webster. Don’t limit yourself to the health club, recommends Teresa Robinson, a Kansas–based physical therapy assistant and longtime group exercise instructor. Robinson has taught senior classes at the local YMCA, helped develop wellness programs and health risk appraisals for corporations and provided education and training to clients with diabetes. She wants to do more but is running out of time. “As you can see, I have a huge workload and no problem with job security,” she says. “The reward for all I do is that I love my job!” The opportunities in the field for personal and professional success are endless. Medical fitness provides the transition from cardiac rehabilitation to a Saturday morning ritual of water aerobics at the local gym. It can transform a medical diagnosis complicated by a lifetime of inactivity into a vehicle for permanent lifestyle change. But for this growing field to achieve its full potential—and be embraced by physicians and hospitals—it requires a career force of competent, qualified and motivated advocates. Medical fitness is the bridge from medicine to prevention. The industry pioneers have laid the groundwork—are you ready to help your clients cross? Below are the jobs that three medical fitness professionals hold, along with their advice for seeking a career in this field. Who: Owner of Function First Inc. in San Diego and author of The Pain-Free Program: A Proven Method to Relieve Back, Neck, Shoulder and Joint Pain (John Wiley and Sons 2005). Career: Master’s degree in biomechanics and athletic training. Works primarily with clients with musculoskeletal pain or challenges who have exhausted their medical benefits or have not had the success they wanted through avenues such as surgery, chiropractic, medications, physical therapy, acupuncture, etc. Who: PhD candidate; medical fitness trainer at Genesis Health Clubs, a for-profit fitness center in Wichita, Kansas. Career: Master’s degree in health sciences. Spends 50% of personal training hours working with the medical fitness population, including people with orthopedic injury, Parkinson’s disease, cancer, osteoporosis, fibromyalgia or low-back pain. Who: Fitness director at The Wellness Center at Meadowmont, University of North Carolina Health Care. Career: Master’s degree in physical education with an emphasis in exercise physiology. As fitness director at a hospital-based wellness center, oversees group exercise instructors and fitness staff. Also serves as a liaison between the medical community and the fitness and exercise departments to ensure safe and effective transition of medical referrals. Medical Fitness Association (MFA), www.medicalfitness.org. Founded in 1991, the MFA focuses on hospital fitness and wellness centers. The only professional organization devoted to medical fitness, it offers a variety of resources, conferences, memberships and other opportunities to medical fitness professionals and the facilities that employ them. The MFA has recently released The Medical Fitness Model: Facility Standards & Guidelines to help medical fitness centers best meet the needs of their members. American College of Sports Medicine (ACSM), www.acsm.org. The ACSM Exercise Specialist and Clinical Exercise Physiologist certifications provide quality credentials for medical fitness professionals. The organization also publishes the ACSM Health & Fitness Journal. a variety of special populations. The ACE Clinical Exercise Specialist Manual offers an excellent resource for exercise development and design for a variety of special populations. Natalie Digate Muth, MPH, RD, CSCS, is an ACE master trainer and a registered dietitian. She is currently attending medical school at the University of North Carolina at Chapel Hill. She can be reached at Natalie_Muth@med.unc.edu. Administration on Aging. 2004. Statistics on the aging population, 2004. www.aoa.gov/prof/Statistics/statistics.asp; retrieved Apr. 4, 2006. American Council on Exercise. 1999. Clinical Exercise Specialist Manual: ACE’s Source for Training Special Populations. San Diego: American Council on Exercise. Medical Fitness Association. 2004. The Medical Fitness Association. www.medicalfitness.org/displaycommon.cfm?an=1; retrieved Apr. 4, 2006. Medical Fitness Association. 2006a. The Medical Fitness Model: Facility Standards and Guidelines 2006. Available to MFA members at www.medicalfitness.org. Medical Fitness Association. 2006b. Press release (Feb. 22): Medical fitness standards and guidelines. www.medicalfitness.org/displaycommon.cfm?an=1&subarti lenbr= 58; retrieved Apr. 4, 2006. Want more from Natalie Digate Muth?